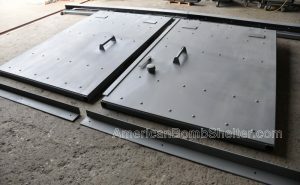 Four threshold styles and many other options: assault resistant cam latches, wide angle viewer, deadbolt locks, and more! 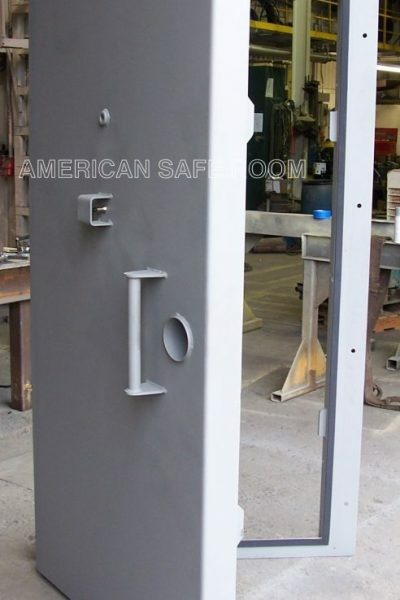 50 PSI blast load rating, bolt on or pour-in-place. 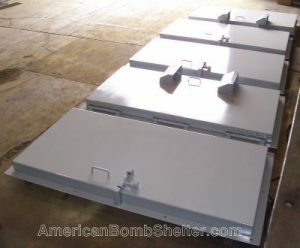 A steel envelope that you fill with four inches of bullet and torch resistant concrete that you pour into the open top after the door is installed on the wall. 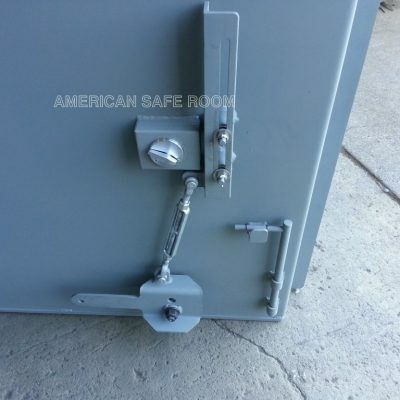 Many options are available like viewers, differential pressure gauges, deadbolt locks, and assault resistant cam latches. 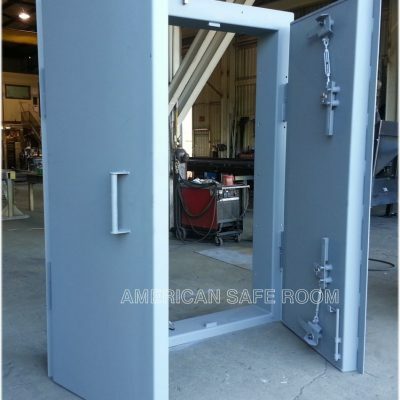 50 PSI blast load rating, bolt on or pour-in-place. 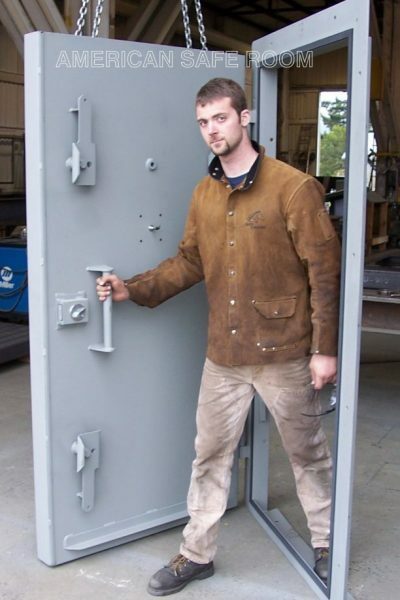 Just like our single leaf blast door, only wider – up to 8 feet wide so you can get a vehicle through. 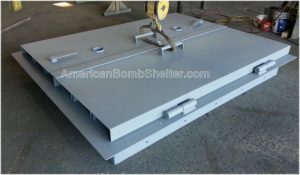 A steel envelope that you fill with four inches of bullet and torch resistant concrete that you pour into the open top after the door is installed on the wall. 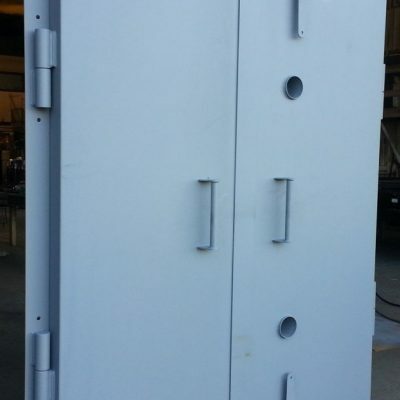 Many options are available like viewers, hasp assemblies, and assault resistant cam latches. 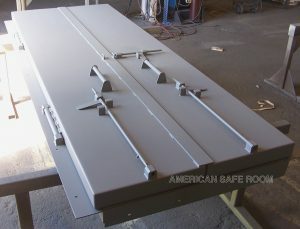 This is our response to the ornamental vault style doors being marketed for safe rooms. 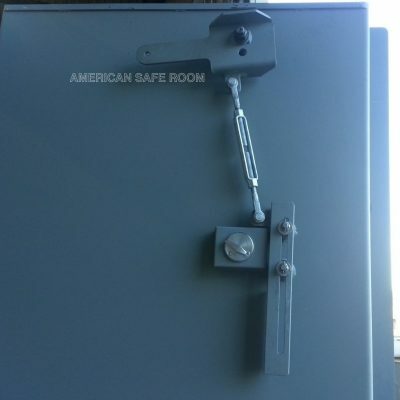 It features three rotating cam latches that are slaved together and operated by one lever. 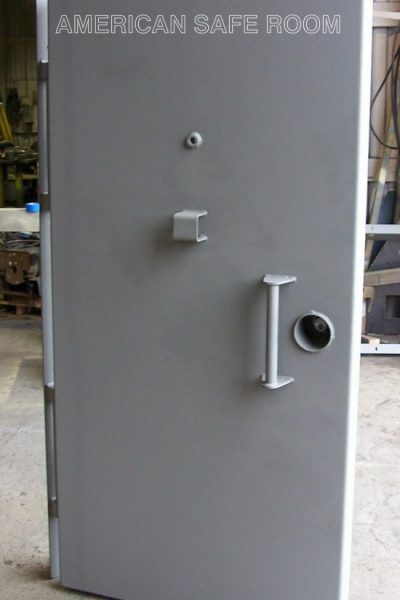 The encrypted keypad on the outside is connected to a deadbolt on the inside that is mounted on a rotating hard plate. 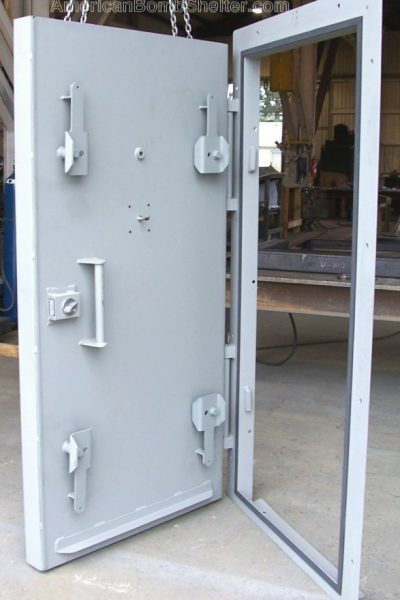 This lockworks is mounted on our concrete filled blast door leaf. 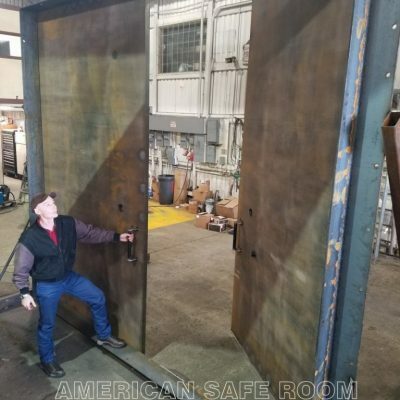 The ballistic rating is UL 752 level 8 (7.62 NATO ball makes it about half way through), it cannot be cut with a torch, and it is engineer certified to withstand a 50 PSI blast pressure event! 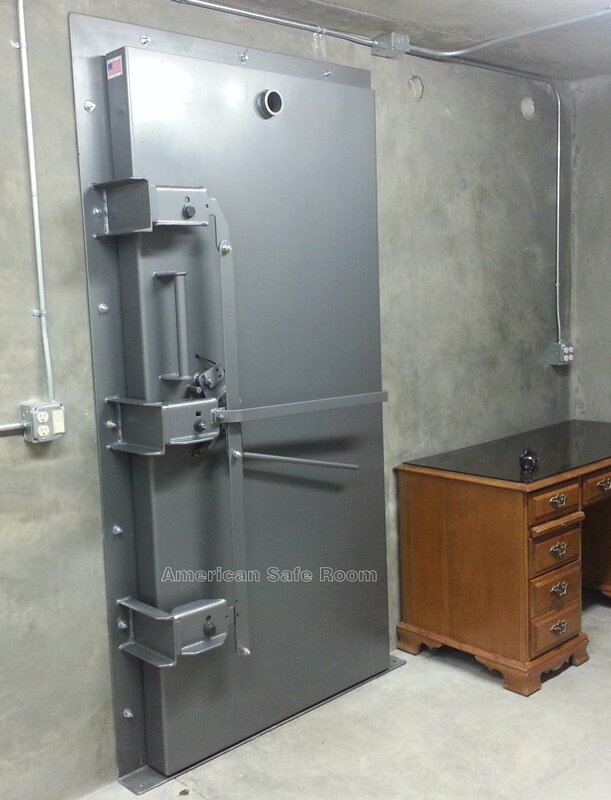 This is a bullet resistant garage door. 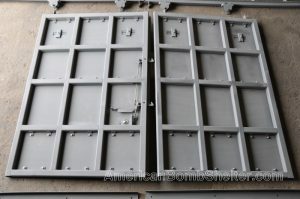 Please contact us for price and details. 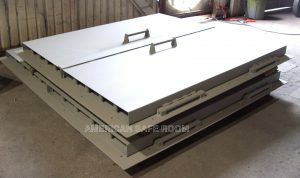 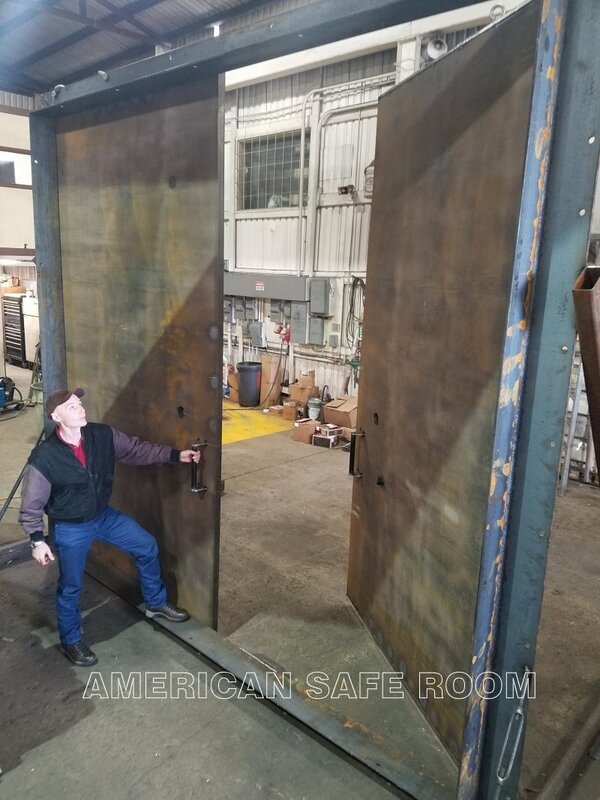 We’ve placed a lot of these doors in industrial applications: chemical plants, foundries, ordnance storage magazines, ordnance testing ranges, refuge chambers, and even a rhinoceros enclosure at a zoo. 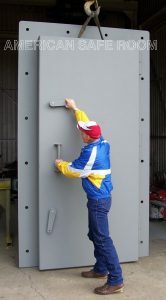 See this page on our dedicated blast door website for a list of these doors. 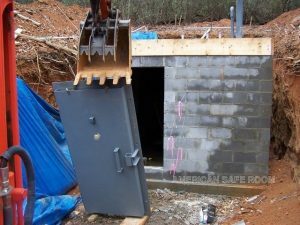 If you have an application that needs to protect from, or to contain a detonation, please contact us.